Happy Valentine’s day! Although I’ve posted a couple recipes for this occasion already, white chocolate raspberry roses, and key lime cheesecakes, this is the official Valentine’s post. 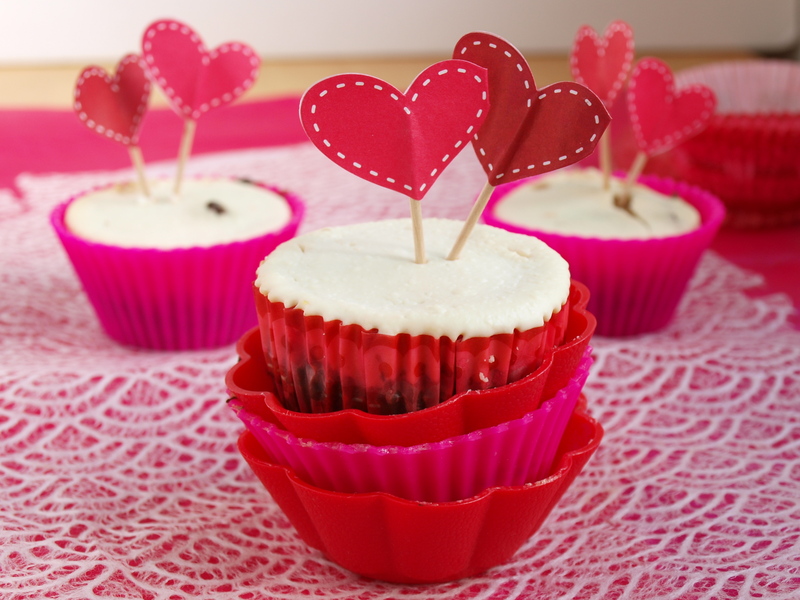 These cupcakes are fancy enough…special enough…time consuming enough (sometimes you need a special occasion to do something that takes a little more time)…for Valentine’s day. Or for a birthday. These served as birthday cupcakes for my boyfriend over the weekend, and today they’re my post. What makes them special is multiple layers. And in terms of my favorite types of cakes and ingredients? Nobody’s left out. You have chocolate. You have cheese cake. And a peanut butter surprise. Really, I think this is my dream dessert. divide equally amongst your cupcake liners, (this made 34 for me)—be sure leave room for the cheesecake layer! 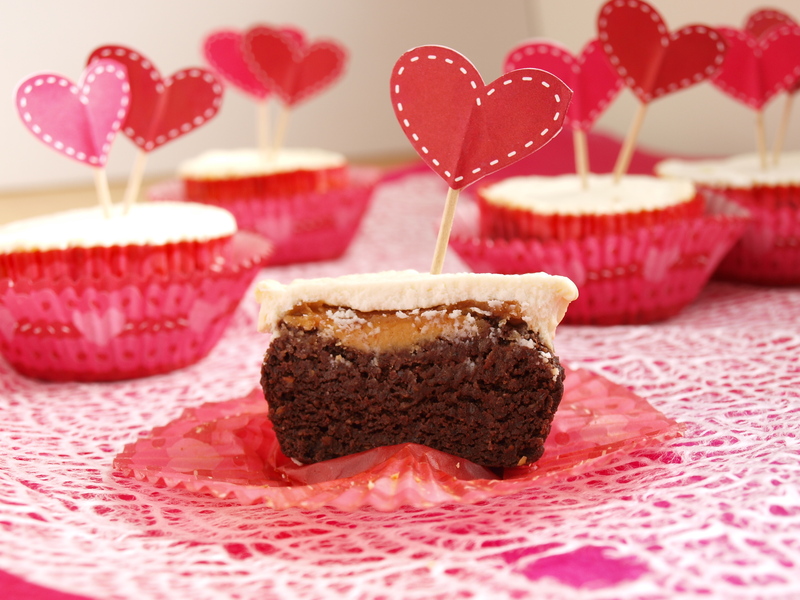 spoon your peanut butter into the center of each cupcake, and press down so it’s not visible–this should be a surprise! When I mixed all ingredients prior to pouring, it looked like I had about equal amounts of cheesecake and chocolate. But the cheesecake layer doesn’t have any baking powder or baking soda I suppose. I was surprised–It almost looks like it’s cheesecake icing. But don’t worry, they are delicious! Next time I may play around with the proportions. If you like your desserts super sweet you may want to add a little stevia to the chocolate cake section, though I thought it was just right. When you think about it, you’ve got more than a peanut butter surprise. The beans are a bit of a surprise. The fact that there is no white flour…no sugar…no butter…these are all surprises, unbelievable ones, I think! Here you’ve got a treat that gives you some real energy, won’t peak your blood sugar, and comes with some fiber and protein. Next time I’ll just have to figure out how to hide some vegetables in it! Are you eating or making anything special today? Wow, I am LOVING the list of ingredients! Seriously! This is so right up my alley. I so badly have to try them, and I will be doing that very soon, I can guarantee it. Do you have a single twin sister who cooks like you and wants to marry me? Hahah, sadly I’m an only child….I say meet a nice girl and send her to my blog? Or better yet, bake these FOR a nice girl!